Eco-Maxi comes with glass plates with 21 cm width and 20 cm length. Eco-Maxi is also compatible for Maxigel glass plates. For electrophoretic separation under controlled temperature conditions the use of the EBC buffer tank with cooling option (integrated water circulation system) is recommended. The problem of smiling effects and ineffi cient protein resolution due to the heat development in larger gels is reliable avoided. The buffer chambers EB (without cooling option) and EBC (with cooling option) are compatible with the Blot Module for Tankblot Eco-Maxi. For tank blotting, the use of buffer tank EBC with integrated cooling option is recommended. When using the buffer tank EB without cooling option, the transfer should be performed in a cold room. The Bigfoot Safety Lid with its specially designed foot allows a space saving and safe storing of the lid when not placed on the buffer tank. 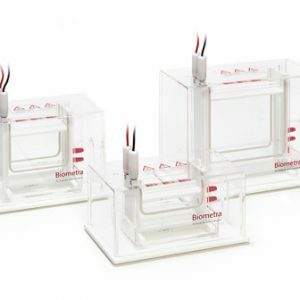 According to customer requirements a lot of special confi gurations by a large number of additional component parts are possible (i. e. analytical, preparative or microtiter plate compatible combs). corresponding electrophoresis apparatus into a powerful wet-blotter. 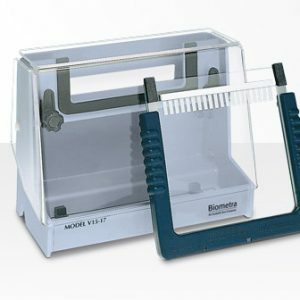 The casting chamber allows an easy, fast and leak-proof assembly for 1 or 2 glass plates sandwiches. Preliminary, for casting gels one or two glass plates sandwiches are set into the electrophoresis module and fixed with the side clips. Because the spacers are permanently fixed to one glass plate, the often difficult adjustment of large spacers and glass plate is no longer necessary. 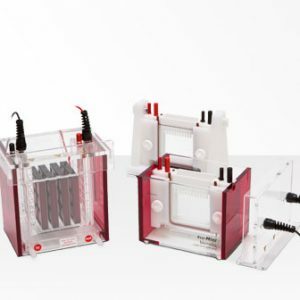 In a second step, the electrophoresis module with the glass plates sandwiches is inserted into the specially designed gel casting stand and it is fixed easily and reliable by two eccentric vices. By the use of a unique high-tech material for the gasket in the casting stand and special anti-slip device of the side clips leakage proof is guaranteed. 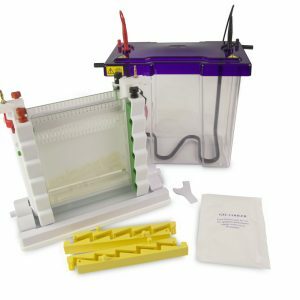 After polymerisation of the gels, the complete assembly of electrophoresis module and glass plate sandwiches are taken from the casting chamber into the buffer tank for electrophoretic separation. Specially formed slots in the side walls of the buffer tank allow a rapid and safe positioning of the module. 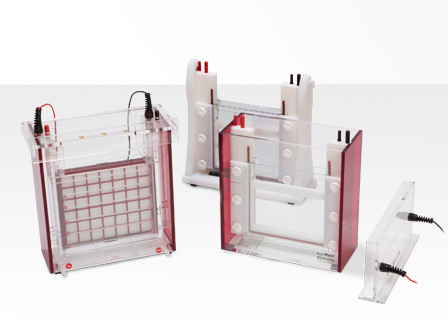 Eco-Maxi System EBC, complete system with buffer chamber EBC (with integrated cooling base), Bigfoot Safety Lid, Electrophoresis Module, 2 glass plates with fixed 1.0 mm spacers, 2 notched glass plates, 2 combs (1.0 mm, 12 wells) and Casting Stand.